The body of literature concerned with social pedagogy has been growing over the last few years. Here we aim to list the key books, research reports and journal articles on social pedagogy. Please note that these are ordered alphabetically, with links included where possible. Enjoy the read! 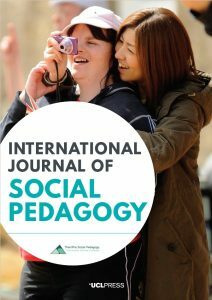 The International Journal of Social Pedagogy seeks to make a substantial contribution to the cross-cultural discourse around social pedagogy. With emphasis on a theory-practice connection, articles in IJSP reflect a wide range of social pedagogical traditions and provide a greater understanding of social pedagogy in ways that are both relevant at a practice level and contribute to the body of theory and research. has been jointly developed by ThemPra and the Centre for Understanding Social Pedagogy at the UCL Institute of Education and is currently published by UCL Press. As an open access journal all articles are available free of charge. IJSP is the only UK based English-language journal dedicated to social pedagogy and has so far attracted substantial international attention. It has been praised for being ‘at the forefront of developing a scholarship in social pedagogy in an English language context, attracting a mix of local and well-known international contributors’. The body of literature on social pedagogy available in English is growing rapidly. Below we’ve aimed to pull together a comprehensive list of key literary works on social pedagogy. Our top 3 recommended books are highlighted in bold. Boddy, J. (2003). Working with children: social pedagogy and residential child care in Europe. London: University of London. Boddy, J., Cameron, C., Moss, P., Mooney, A., Petrie, P. & Statham, J. (2006). Introducing Pedagogy into the Children’s Workforce. Maidenhead: Open University Press. Crimmens, D. & Milligan, I. (2005). Facing Forwards: Residential Child Care in the 21st Century. Lyme Regis: Russell House Publishing. Edwards, C., Gandini, L. & Forman, G. (1993). The Hundred Languages of Children. Norwood: Ablex. Eriksson, L., & Winman, T. (2010). Learning to Fly: Social Pedagogy in a Contemporary Society. Gothenburg: Bokforlaget Daidalos. Freire, P. (1996). Pedagogy of the Oppressed. London: Penguin Books. Gustavsson, A., Hermansson, H.-E., & Hämäläinen, J. (2003). Perspectives and Theory in Social Pedagogy. Gothenburg: Daidalos. Hatton, K. (2008). New Directions in Social Work Practice. Exeter: Learning Matters. Jackson, R. (2006). Holistic Special Education: Camphill Principles and Practice. Edinburgh: Floris Books. Kaska, M. (2014). Social Pedagogy – An Invitation. London: Jacaranda Publishing. Kornerup, H. (2009). Milieu-therapy with children. London: National Children’s Bureau. Lifton, B. J. (1988). The King of Children: A Biography of Janusz Korczak. London: Chatto & Windus. Lorenz, W. (1994). Social work in a changing Europe. London: Routledge. Petrie, P., Boddy, J., Cameron, C., Wigfall, V. & Simon, A. (2006). Working with Children in Care – European Perspectives. Maidenhead: Open University Press. Petrie, P. & Simon, A. (2006). Residential care: lessons from Europe. In E. Chase, A. Simon & S. Jackson (Eds.). In Care and After: a Positive Perspective. London: Routledge. Smith, M. (2009). Re-Thinking Residential Child Care. Bristol: Policy Press. Several evaluations and reports have examined the potential and actual benefits that social pedagogy can bring where services have introduced it. Comparisons between the different reports further highlight that the most successful strategies are underpinned by social pedagogical principles themselves. Our top 3 recommended reports are highlighted in bold. Association of Directors of Children’s Services (2013). ADCS Position Statement What is Care For: Alternative Models of Care for Adolescents. Manchester: ADCS. There is an increasing range of articles on social pedagogy published in academic journals and magazines for the children’s workforce. We have aimed to bring together the most significant ones and link them for ease of accessing them – some are accessible for free (dark teal), others only via academic journals that require subscriptions (light green). The 5 must-read articles are highlighted in bold. Kyriacou, C., Mylonakou – Keke, I. & Stephens, P. (2016). Social Pedagogy and bullying in schools: the views of University students in England, Greece and Norway. British Educational Research Journal, 42(4), 631-645.